"Wow, the root canal I had done was no big deal! I didn't feel a thing." In the past, injured or diseased teeth frequently had to be removed. Today, they often can be saved through endodontic treatment. Also known as a root canal treatment, this procedure may be performed by Dr. Melissa or a specialist called an endodontist. More than one office visit usually is required. A root canal is one of the most common dental procedures performed, well over 14 million each year. This simple treatment can save your natural teeth and prevent the need for dental implants or bridges. A root canal treatment generally involves the removal and replacement of a tooth’s pulp. The pulp is soft tissue containing blood vessels, nerves and connective tissue. 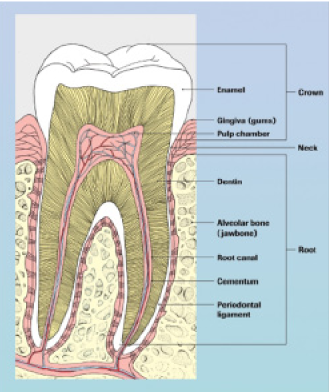 The pulp is found in a canal that runs through the center of the hard tissue on the inside of the tooth (the dentin). The pulp extends from the pulp chamber in the crown down through the root canal to the tip of the root in the jawbone. A tooth has only one pulp chamber but may have more than one root and several root canals. If pulp becomes damaged through injury or disease and cannot repair itself, bacteria and their products can leak into the pulp and cause the pulp to die. If a root canal procedure is not performed, an abscess can form at the tip of the root and cause considerable pain. Even if there is no pain, the bone anchoring the tooth in the jaw can be damaged. Without treatment, the tooth may have to be extracted. Here is what you can expect when you schedule a root canal treatment. Local anesthetic usually is given, to maintain patient comfort. The affected tooth is isolated from saliva with a rubberlike sheet called a dam. An opening is made through the crown of the tooth. The pulp is removed, and then the root is cleaned and shaped. Medication may be added to the pulp chamber and root canal(s) to help eliminate bacteria. A temporary filling is placed in the crown opening to keep saliva out. Antibiotics may be prescribed if an infection is present and has spread beyond the end of the root(s). The root canal is filled and permanently sealed. (A metal or plastic rod or post may be placed in the root canal for structural support.) If an Endodontist performs the procedure, he or she usually will send you back to Dr. Melissa for preparation of a crown to be placed on the tooth. Crowns are made from a variety of materials, depending on the location of the tooth, the color of the tooth and the amount of natural tooth remaining. Feel free to discuss with us which option is best for you. The restored tooth can remain healthy as long as its roots are nourished by the surrounding tissues. Good oral hygiene at home and regular dental visits can help prevent tooth decay and gum disease. If you take good care of it, the restored tooth could last a lifetime.